Last fall, the timing of the ORC was perfect because I was looking for a motivational push to create a playroom for our two little girls who were transitioning from daycare to being back home while I got HRDC up and running. The 6-week timeline of the ORC was exactly what I needed to pull everything together and the end result continues to be one of my favorite designs to date. I expanded outside my usual neutral palette with a parade of pattern and color and created some play areas straight out of my own childhood dreams. To say my girls love what we created would be an understatement. And I love it just as much! This round, I’m doing things a little differently. Since we’re currently smack dab in the middle of a major master bath renovation and our house has been in chaos, I can’t imagine taking on another home project. So instead, I’m highlighting a client project that just kicked off because it’s one that is near and dear to my heart. Two of our closest friends are in the final months preparing for the arrival of their first baby (a girl!) and I get the pleasure of helping them bring the nursery of their dreams to life. How lucky am I?? My heart really does skip a beat to think of all the wonderful things that await these two in this new stage of life. So many memories are made in the nursery and to know that I get to play such a big role in setting the stage for those moments is something that I treasure. I actually just teared up writing that…dang, where’s the tissues when you need them… Anyway, great things await these two and they deserve the best! I’ve got to say, too, that kids’ rooms are quickly becoming my favorite ones to design. 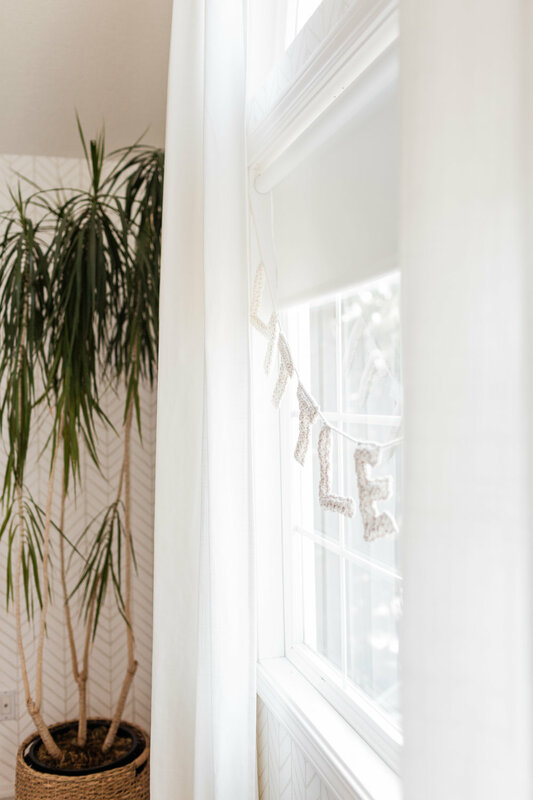 I’m sure it stems from being so deeply entrenched in mom life right now with a 2- and 3-year-old running around and having completed our playroom and my daughter’s nursery recently. I found so many incredible ideas while I was dreaming those rooms up, so I’m excited for the opportunity to bring some more creations to life! These pics don’t really do justice to the beautiful gray carpet and walls or the flawless white trim and baseboards. 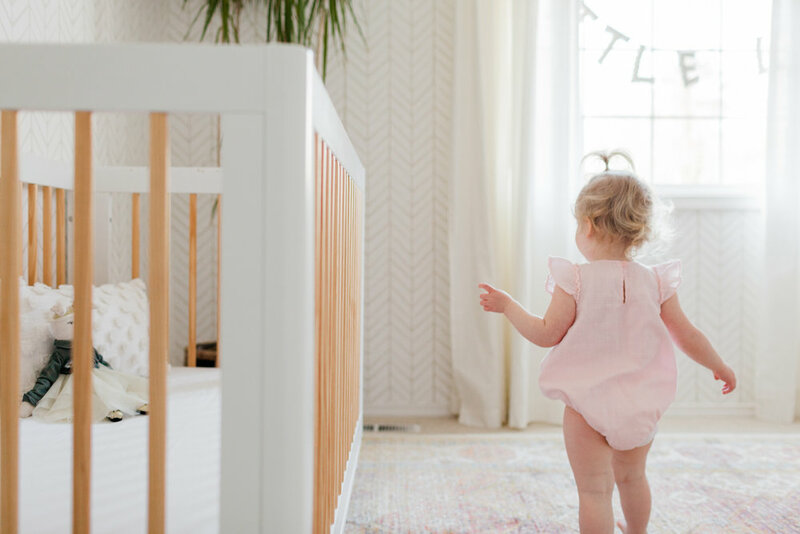 It’s really a beautiful home and at about 110 sq ft, this room is a great size for a nursery! She already scored a great deal on this Pottery Barn dresser from Craigslist. We’re going to change the knobs out to something with a slimmer and more modern profile to update it to their clean, modern aesthetic. They also went with the tride-and-true IKEA Sniglar crib. I know so many people with this crib and we have one ourselves. For the $79 price tag, it really can’t be beat. With two of the major essentials ticked off the list, we’re in stellar shape. 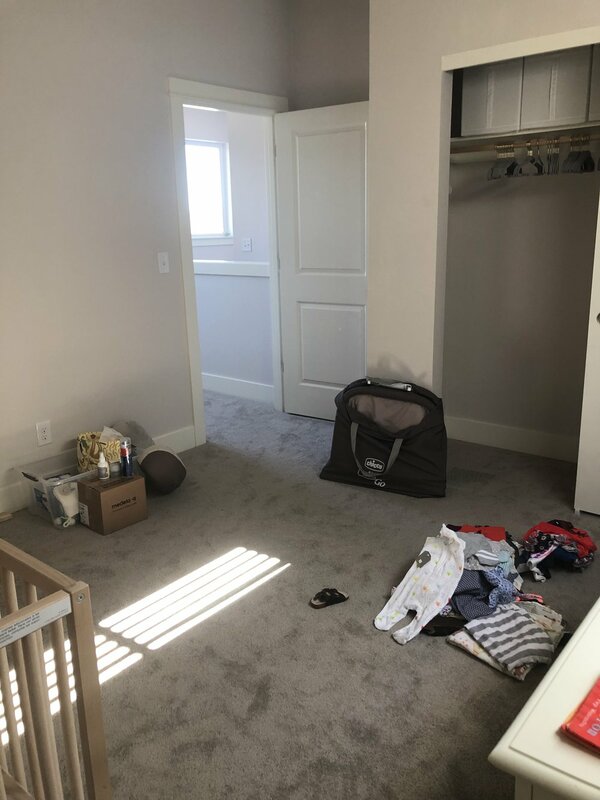 I imagine this room will be more than ready for her photo shoot when we hit the 6-week mark, but you never know what issues could come up with product ordering. Sometimes things take way longer to arrive than you expect. Fingers crossed everything goes smoothly and I’ll be back next Thursday to share the mood board and design concept we envision for this sweet babe’s space!